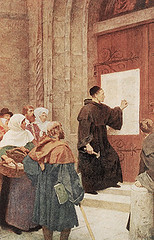 Martin Luther’s Treatise on Christian Liberty | The Old Adam Lives! This class is just 49 minutes long and packed with great, freedom giving gospel and awesome “ALL or NOTHING” Lutheran theology. If you re only going to listen to one great class on Christian freedom this weekend, make it this one. Thanks to flickr and honecr5 for the photo. Is it possible to read a transcript of your messages? I can read so much faster than I can listen. I rarely watch videos of anything, but your classes and content sound great! I don’t think Pastor Mark will mind me just jumping in here because I’m not sure if he will check this (blog) today (sometimes he does) and see your question. Pastor Mark does not have his messages written out. He generally works from an outline and then expands on his main points. This is pretty much true for both his sermons and his classes. I know he will appreciate that you are enjoying his preaching/teaching. Thanks very much, Helen, and God bless you! Shortly after I wrote this note I realized it was not actually Pastor Mark’s blog as such. I’ve been reading so much lately I’m getting some of the blogs and websites confused. I think I found this site (you) on Gene Veith’s blog which I follow. Thanks for helping. I just wish I had the time to listen to all of Pastor Mark’s messages. Its just that I’m a much faster reader than I am a listener. Ouch, just now I scrolled back to read your little bio and I see I’ve already asked to join your blog. Can you believe? I’m so sorry. You must think I nuts. DId you attend church before you became a Lutheran? I’m am always interested in hearing about folk’s experiences. Nothing to be sorry about, Helen. This is an informal group and we welcome all comers. Consider yourself included here. I bounced around quite a bit (church wise) before I met my wife who is a lifelong Lutheran. My wife says she never heard preaching of the type that Pastor Mark does, but got a steady dose of fire and brimstone growing up. We feel very blessed to have found (been placed??) a place where we can hear the truth about ourselves, and then hear the pure, sweet Word of the gospel for the forgiveness of our sins. PS- In my comment above your last one, I meant to say “Pastor Mark WON’T mind”…not WILL mind. There’s so much to read and absorb, isn’t there! I had attended 2 or 3 Lutheran churches years ago and never heard any fire and brimstone. Didn’t know they ever mentioned it. The LCMS congregation we are attending now is much more informal than the churches I recall of a long time ago. I grew up in a non-denominational type setting but mostly with Baptist leanings. And most of it was good. I do like the litergical type service of the Lutheran church. And I love their view of the Lord’s Supper. I am thinking of betting the Lutheran Study Bible. Have you seen it and what do you think of it? The Concordia edition of course. You have of things to read on you website. Oh for more time!! Lots of good stuff out there, that’s for sure. My wife’s F&B Lutheran church was in Chicago where she grew up. I guess many of the old F&B preachers are gone now. I have heard nice things about the Lutheran Study Bible. I don’t have one and pretty much just use my Bible and rely on my pastor. Glad you are enjoying Lutheran worship. I know you don’t have a whole lot of time, Helen, but when you get a bit of it listen to Pastor Mark’s sermon in the post, “I Believe that I Cannot Believe”. It’s my all time favorite.